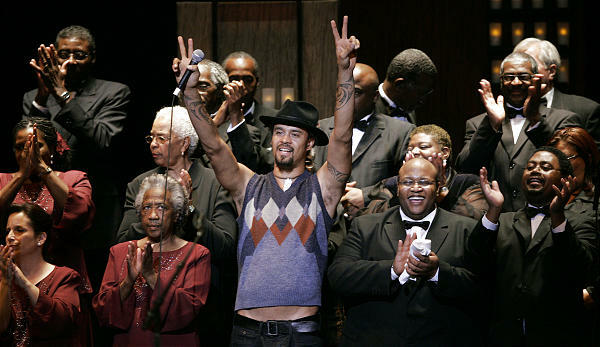 Michael Franti sings with the Calvary Baptist Church Gospel Choir as part of "Raise the Roof! A Celebration of Diversity," at the Capitol Theater Wednesday. The audience roared for Franti, singing, dancing and clapping along. Take the cause of diversity in higher education. Add a little spiritual groove. Toss in some cheers, claps and stomps. You'll have "Raise the Roof! A Celebration of Diversity." More than 1,000 people filled Capitol Theater on Wednesday, singing along to the grooves of Michael Franti and the spirituals of the Calvary Baptist Church Gospel Choir. The event was an uplifting fund-raiser for the University of Utah College of Humanities Community Scholarship for Diversity and for the Calvary Baptist Church's youth mentoring program. "We come together because of diverse backgrounds but also to share what we have in common — music," said the Rev. France Davis of Calvary Baptist Church. "Music is the medicine of the soul." With opening soloist Anthony Carpenter's call to "put your hands together," the Calvary Baptist Church Gospel Choir had the audience members out of their chairs and clapping along. And that was just Act One. The audience roared for Michael Franti, singing, dancing and clapping along, remaining enraptured to the end when the Calvary choir joined Franti for a refrain of "We shall overcome." Many in the audience joined hands, swaying to the spiritual. 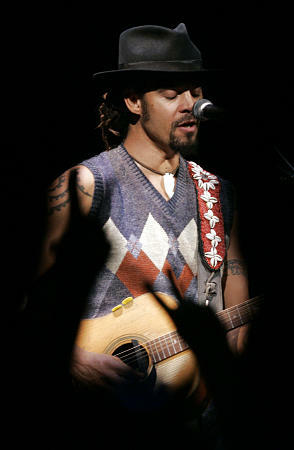 Michael Franti performs at Wednesday's fund-raiser. and Calvary Baptist's youth mentoring. U. Humanities Dean Robert Newman drew boisterous applause with his greeting of "tonight we intend to raise the roof for diversity ... We at the College of Humanities stand for diversity, not because it's the politic thing to do, but because it's the right thing to do." Franti, who performed at a reduced nonprofit rate, at one point noted he never thought he'd be in Salt Lake City performing with a Baptist choir, "Celebrating diversity. It's a wonderful thing." Overall, organizers hoped to raise around $50,000, most for the U. humanities scholarship and about a fifth going to Calvary's youth mentoring program. During the event, the U. humanities faculty presented a $7,000 check and the college's partnership board gave $18,000. Ticket proceeds were also donated to the education programs, and donations were collected at the event. The Deseret Morning News is among corporate sponsors. Each year the U. provides $5,000 scholarships to first-generation college students, based on merit and need. Calvary's program promotes literacy through an early education program and offers youth mentoring, as well as providing college scholarships. So far the U. scholarship program has funded 24 students. Fourteen have graduated and another six are set to graduate this academic year. Four more are on track to graduate in 2009. The Calvary program works on literacy with up to 100 young children. About 12 college students receive $1,000 or $1,200 scholarships, and about 40 receive $500 in book money.